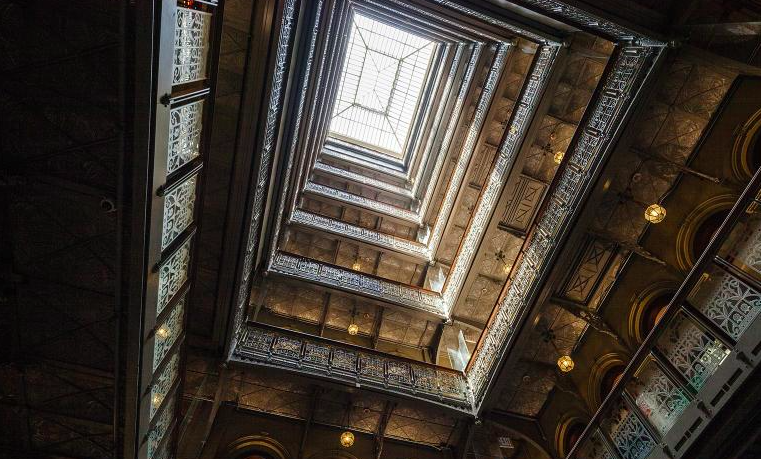 Just when you thought that everything in New York had been discovered, along comes The Beekman, whose magnificent Victorian atrium has caught everyone by surprise. Sherlock Holmes-meets-Agatha Christie is the flavour of its new theatrical interiors, and providing pizzazz are two of the city’s top restaurateurs. The dark twisty canyons of the Financial District used to be home to bankers and lawyers. Now that One World Trade Center and its environs are filling up with creative types and fashion magazines such as Vogue, the area is getting a facelift. The Beekman is on a quiet street just one block from City Hall Park, a five-minute walk to One World Trade Center, the 9/11 Memorial and Museum, the porcupine-like Oculus (a cathedral-like transit hub with an ultra-posh mall) and Battery Park. Also nearby is South Street Seaport which boasts unique boutiques, wine bars and the hip Smorgasburg food market. At Pier 11 Wall St, take the ferry to Brooklyn or Hoboken. This pint-sized 19th-century ‘skyscraper’ was built in the early 1880s around the same time as the Brooklyn Bridge. Its nine floors are capped by two big turrets (now a pair of two-storey penthouses). The heart of this handsome red-brick structure is the atrium, with its fantastical wrought-iron balustrades depicting dragons, sunbursts and flowers, pretty terracotta floor tiles and glass pyramid dome. The interior décor is by British architect Martin Brudnizki (famed for London’s Ivy and Le Caprice restaurants). The result feels like the setting for an Agatha Christie murder mystery – all fringed lampshades, enormous bookcases filled with curios and a clubby palate of absinthe green, dusky pink and shades of cocoa and St Bruno. The lighting is set permanently to twilight. The hotel is a jazzy social hub with two top restaurants and a nightclub by impresario Serge Becker, which is set to open in 2017. For recovering afterwards, there is a two-storey fitness centre (opening in November). Oddly, there is no spa and the roof terrace can only be used for private parties. The concierge team, however, are five-star. Valet parking is $65 (£49) a night. The 287 rooms are luxurious, if a little cramped, on the more affordable end of the range, but large, high-ceilinged and glamorous from ‘Premium King’ level and up. 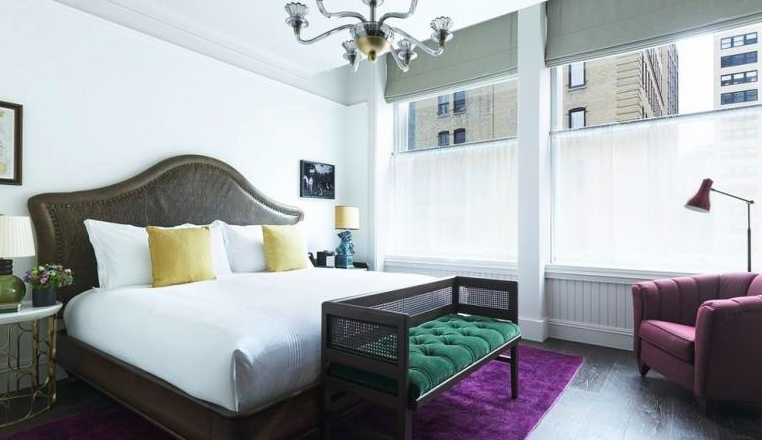 Hammered leather headboards, Sferra linens, an enormous custom-built armoire that looks like it should contain Narnia, swag lamps, marble desks and an intriguing mix of modern artworks all feature. The generous white Carrara marble bathrooms are reached via a sliding barn-style door. There’s a large TV, a Revo player and cult Brooklyn perfumier D.S. & Durga supplies the toiletries. The hotel has two of the city’s top restauranteurs under one roof. 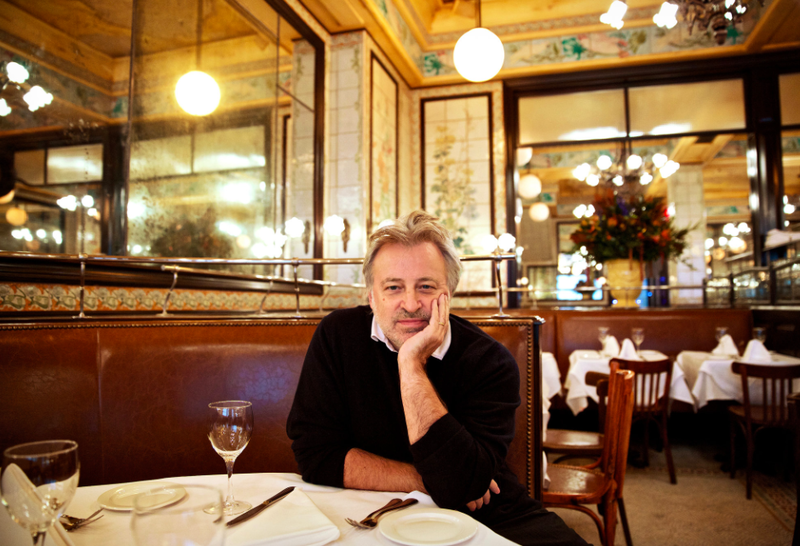 Keith McNally’s Augustine brasserie is his best to date, surpassing his famed Balthazar restaurant. Chefs Shane McBride and Daniel Parilla serve up melt-in-your-mouth dishes such as soufflé au fromage ($19/£15)), fois gras Augustine ($26/£21) and rotisserie prime rib that is buttery soft and bursting with flavour ($54/£43; suitable to share). Chef Tom Colicchio’s Fowler and Wells restaurant holds court in the main hotel dining room and bar/lounge space. It is stalwart good cooking – think rabbit schnitzel and loin of lamb (mains from $28/£22). Colicchio also provides the room service and breakfast – everything from yogurt to the ‘graffle’ (a foie gras waffle). Double rooms from $458 (£343) in low season; and from $710 (£532) in high season. Breakfast excluded. Free Wi-Fi. There are 14 wheelchair-adapted rooms and blinking lights for the hard of hearing in the event of a fire. Cots are complimentary and rollaway beds are $75 (£56) a night. 25 per cent of the rooms have interconnecting doors. Children get a special amenity bag, colouring books and scavenger hunts. Pets (up to 35lb) are pampered with a plush bed, amenity bag and ‘I’m staying at the Beekman’ tag. 123 Nassau St, New York, NY 10038, United States.